Hudson Real Estate Monitor: Despite lingering uncertainty, survey says brokers, developers and lenders expect more activity in 2012. 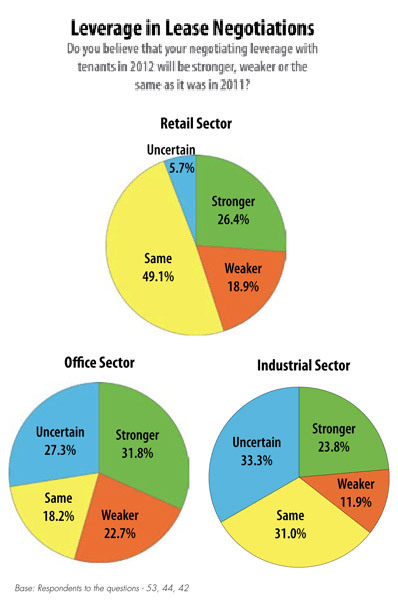 Despite lingering uncertainty, survey says brokers, developers and lenders expect more activity in 2012. Most brokers, developers and lenders expect business activity to increase in 2012 compared to 2011, according to a survey of more than 160 commercial real estate professionals across the Northeast. Northeast Real Estate Business conducted the exclusive survey in late 2011. Just over two-thirds of the brokers responding to the survey indicate that they expect their firm’s total leasing and sales transaction volume (by dollar amount) to increase in 2012 compared to 2011. Of these brokers with a positive outlook on the coming year, 29.4 percent expect growth of 5 to 10 percent; 33.3 percent expect growth of 11 to 15 percent; 17.6 percent expect growth of 16 to 20 percent; and 15.7 percent expect growth of more than 20 percent. Brokers expect the highest velocity of sales activity in the multifamily, medical office, and single-tenant retail, followed by grocery- and drugstore-anchored retail and downtown office space. Brokers expect to see low sales activity in the suburban office, retail mall, lifestyle and power center, and hotel sectors. According to the survey responses, brokers anticipate that property sales and new leases or renewals will drive the majority of revenue growth for brokerage firms in 2012, but distressed asset services will continue to drive significant revenue as well. By the numbers, what percentage of brokers anticipate the following business lines will be among the biggest drivers of revenue growth at their firm? Property sales (60.6 percent), new leases and lease renewals (59.2 percent), distressed asset services (26.8 percent), capital market services (19.7 percent), valuations and consulting (18.3 percent), and corporate real estate services (16.9 percent). In the office sector, respondents anticipate that healthcare will be the greatest driver of office leasing activity in 2012, followed by biotech firms, technology, education and pharmaceuticals. Potential buyers in the market will outnumber companies looking to sell. Just over 60 percent of survey respondents indicate that their company will be a net buyer of real estate in the Northeast in 2012, while 16.9 percent intend to be net sellers of properties and 20.3 percent plan to maintain status quo, neither increasing nor decreasing the size of their holdings. Buyers indicate they are most interested in drugstore- and grocery-anchored retail centers, multifamily properties, retail malls, single-tenant retail, and mixed-use properties. When it comes to new projects, companies are feeling more confident and moving forward on development plans. Nearly half of the representatives from development companies that participated in our survey indicate that their company will be breaking ground on a project in the Northeast this year. Thirty percent of respondents whose companies will break ground on a new project this year will develop single-tenant retail properties, 23 percent will develop drugstore- and grocery-anchored retail centers, 20 percent will develop hotel properties and 20 percent will develop multifamily properties. As landlords, most property owners do not expect 2012 to put them in a better position for negotiating leases. For retail properties, 68 percent of respondents expect their negotiating leverage to be the same or weaker than it was in 2011. At office properties, 40.9 of respondents expect negotiating leverage to be the same or weaker while 27.3 percent don’t know what to expect from the coming year. At industrial properties, 42.9 percent expect their leverage to be the same or weaker and 33.3 percent are uncertain what leverage they will have. Almost 85 percent of the lender survey participants expect their companies to loan more dollars in 2012 than in 2011. Only 3.8 percent of lender and intermediary respondents expect to loan less money while 11.5 percent anticipate lending approximately the same amount this year as they did last year. Of the respondents that anticipate an increase in lending volume, 18.2 percent anticipate growth of 6 to 10 percent; 31.8 percent anticipate growth of 11 to 15 percent; 16 to 20 percent anticipate growth of 18.2 percent; and 31.8 percent anticipate growth of more than 20 percent. (See chart to the right.) Across the board, most lenders and intermediaries expect refinancing to make up the bulk of activity at their firms, accounting for an average of approximately 48 percent at these firms, while acquisition financing is expected to account for 30 percent of activity and renovation or redevelopment financing should account for just over 10 percent of lending activity. Nearly 81 percent of respondents rate multifamily properties among the most attractive asset classes for lenders, while 42.3 percent voted for medical office, 30.8 percent voted for downtown office, another 30.8 percent voted for student housing, and 26.9 percent voted for industrial. What factors do lenders expect to impact the availability and cost of debt capital this year? The greatest impact will come from the general health of the U.S. economy. See the chart on page 30 for the range of opinions on other factors, including Fannie Mae and Freddie Mac, the Dodd-Frank Act, the volume of distressed real estate, and the 2012 presidential race. We are finally closing transactions with realistic people and firms that have adjusted to current pricing and market conditions. It has been a long haul and we survived this brutal downturn by providing fee services that were creditable against future commission. I am fairly confident that investment property values in the multifamily and office categories are at or close to their lows for this cycle. I believe that astute investors are beginning to realize this and, as a result, deal velocity should begin to increase within the next 3 to 5 months. — Mark Berezin, president of Infinity Real Estate Group, Inc. In November, Northeast Real Estate Business e-mailed invitations to three separate groups — leasing and investment sales brokers, lenders and financial intermediaries, as well as owners and developers — to participate in an online survey. The purpose of the survey was to gauge leasing and investment sales activity in the Northeast and to capture financing and development trends. A second e-mail blast followed in late November. An invitation to participate in the survey also was included in the Northeast Real Estate Business e-newsletter. The brokerage survey yielded 80 responses with 30 percent of participants holding the title of CEO, CFO, president, partner, or chairman of the board. The developer/owner survey yielded 60 responses. About half of respondents in this group are among the top executives at their firms. Lastly, the lender survey garnered 26 responses. Nearly 20 percent of respondents to the lender survey are in the executive management ranks.